In spite of bad press in the past, coffee is now coming into its own as a beverage that has healthy properties. I’m one of those who is ecstatic over the latest scientific findings. On the other hand, as an instructor in substance abuse counseling, I know it to be a stimulant that can be abused. What we call “uppers,” are a natural way of life for the majority of the population. Consider our love affair with coffee, tea, sodas, chocolate! Oh my!!!! Still, we love these items, and with careful use, they can add so much to our lives. 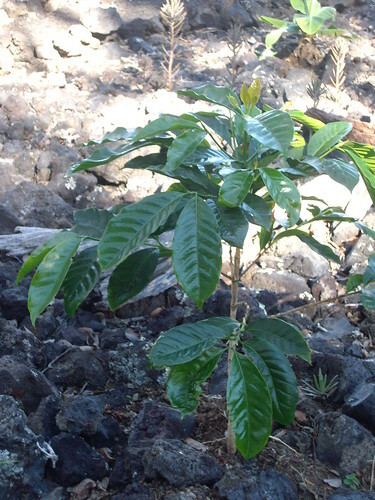 I don’t have a coffee estate, by any means, and I’m struggling to keep my few coffee trees alive. 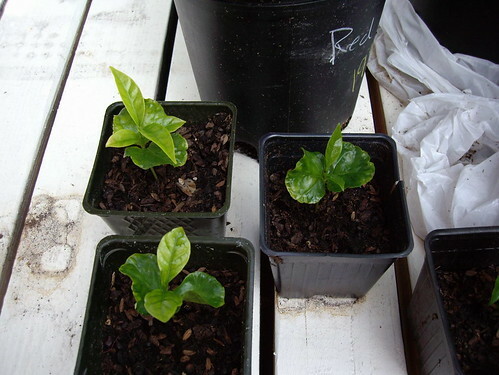 Like most other plants I try to grow, my coffee trees don’t grow very fast. I hope to eventually get a cup of coffee out of what I have. Above, you can see the seedlings I started from raw beans. That picture was taken in June, 2006. Here is the largest of my trees, photo taken in December, 2008. Any guesses as to when I’ll get that first cup of coffee from my own trees? Wonderful! A few years back, I picked up a coffee plant in the local grocery store here in Florida just for kicks. Eventually we decided to turn it loose in the back yard. It was only a year or two before it reached about 5 feet. It didn’t seem to care for our soil (or maybe the reclaimed water) because it always had brown tips. I didn’t really have hopes of producing coffee, but it was fun just the same. The really nice surprise was the incredible fragrance from the few blooms we got. It was worth it just for that! I hope you get to enjoy that in the near future! Next Next post: Is It Frangipani or Plumeria?